Steel Plate Shear Walls are an effective and economical method of resisting lateral forces on structures due to wind and earthquakes. This project use Steel Plate Shear Wall in a ten story building. 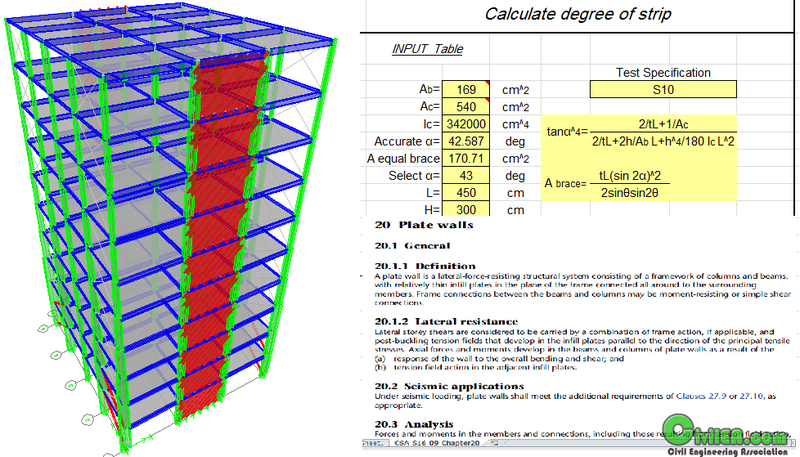 This project use Strip model to analysis steel plate shear wall. This file has a Excel program to calculate parameter in strip model. Also, the screen shot of chapter 20 of CSA-S16-09, is added in the second sheet for more details. Some site steal this material from other site and sell them. But the attached spreadsheet in our forum is translated to English and also the chapter 20 of CSA-S16-09, is added in the second sheet for more details.